Brandy Clark has many times shown that she’s one heck of a songwriter. Recently, her writing talents have been heard on respectable cuts such as Miranda Lambert’s “Mama’s Broken Heart” and The Band Perry’s “Better Dig Two,” while her name appears all over the co-writer credits on Kacey Musgraves’ excellent Mercury Records debut Same Trailer Different Park. Now we get to hear the woman get behind the mic herself with her recently released Brandy Clark EP and her debut single and video “Stripes” – a brash up-tempo number that wouldn’t sound out-of-place on a Miranda Lambert album. The song begins with a bang, opening line “You were lying in there with nothin’ on but a goofy little grin and a platinum blonde” reeling the listener in quickly. Next thing we know, the narrator is cocking a pistol, and we’re beginning to wonder if we’re in for a murder ballad. But she stops short of doing the deed – not in a display of mercy or conscience, but because our fashion-conscious narrator bristles at the thought of having to don a prison uniform, with Clark singing “I hate stripes and orange ain’t my color, and if I squeeze that trigger tonight I’ll be wearin’ one or the other.” It’s a clever and original, not to mention humorous, twist on a tried-and-true country music theme as Clark entertainingly captures the moment of catching one’s partner in the act. Fortunately, “Stripes” doesn’t go so far as to fall into novelty territory, thanks in part to Clark’s fierce, simmering vocal rendering. The fresh, engaging David Brainard-helmed production is a delight, with a jaunty drumbeat and honky-tonk piano lending added grit and punch to the song’s tale. As the first radio bid from an exceptionally talented singer-songwriter, “Stripes” does not disappoint. It’s an ambitious, energetic debut single that makes the prospect of a full-length Brandy Clark album (to be released later this year) even more enticing. Awesome song, awesome writer. Brandy has a real talent for taking conventional themes and giving them that nice twist. Her along with Shane McAnally & Natalie Hemby are quickly becoming some of my favorite writers working in nashville. If Brandy catches on she’ll also be the first female to be openly out to do so. I’m not sure what kind of label she has backing her but I hope she can make some waves. Oo, this is great! It really is the year of the women this year in country music! That is really good. It’s funny and made me think immediately of my fashion conscious daughter. Great job on the review. Looking forward to Brandy’s full length album. I really like this song. It’s amusing, but it’s got enough other great things going for it to sustain it for when the novelty of the cleverness wears off. I’ve ad a chance to hear the album and it’s very, very good. Everything about this song is wonderful. Another great review Ben. Excellent song. Downloaded it while I was watching the video. …another “terrorist attack” on country radio? lambert,monroe, presley, musgraves, perry & clark – what sounds like a slightly crowded law firm is the names of a gang that terrorises country radio by singing to the brain of the audience again. good bye earl and good bye brantley gilbert – i hope. although, she is just stating the bleedin’ obvious – hardly anybody looks good in orange and stripes – it is a brilliant way of highligthing that quite often it is such more or less subsconcious things, like i.e. vanity, that stop us from doing things we would probably regret the minute after – like eating the fifth hot dog too at the ballgame (who really knows – there might be a serious shortage just around the corner). love the strumming and the laconic hook – so smart and so well executed. before i forget it: greetings to my nsa-supervisor, i hope there are more out there like these “new” and most talented female songwriters, hopefully planning more of the similiar. This one is a contender for favorite single of the year. I agree the song’s got some bite behind its novelty. And I think that’s mostly due to the winning, pure country melody. When she sings the lines from the chorus Ben quoted, it’s perfect. Great song. I didn’t think Lambert but thought Musgraves with the tune and words. Yanno, there are a lot of writers going/trying the singing route and this one has the chops to go far. Love the song! Love the song n the video I really like where it was shot n love that someone close to me is in it even though you can’t see his face… She is very talented!!! 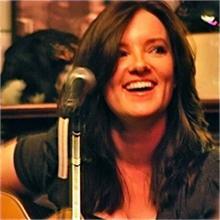 Got the chance to see Brandy Clark in NH last weekend, wow, what a performer! Fell in love with her music when she did the Imus show while out to do the Letterman show, met her after her set, and she’s very kind to her fans, especially the ones who know small-town Washington State.